BTS Dubuque Wrestling - Trained is for all ages (K-12th Grade) and from beginners to advanced wrestlers. Wrestling is a sport that will have a lasting experience to help aspiring athletes develop basic skills for all sports. The students will build self-esteem, perseverance, confidence, discipline, respect, comradeship and emotional control through training in wrestling. Free-Style, Greco Roman and Folk Style Wrestling Academy. USA National Team Members level coaching by former USA National Team Members Jon McGovern & Mike Mena, NCAA Champion & 4X NCAA All-American Josh Terrell, MMA Superstar Cole Williams, local college stand outs Derek Mizaur, Brian Travis, Chris Sokol, and former college wrestlers Anderson Sainci & Eric Daughetee & many more former college wrestlers and coaches. Beat the Streets – Dubuque, a non-profit corporation, strives to cultivate and support youth development programs in underserved communities in the Dubuque and surrounding tri-state area. 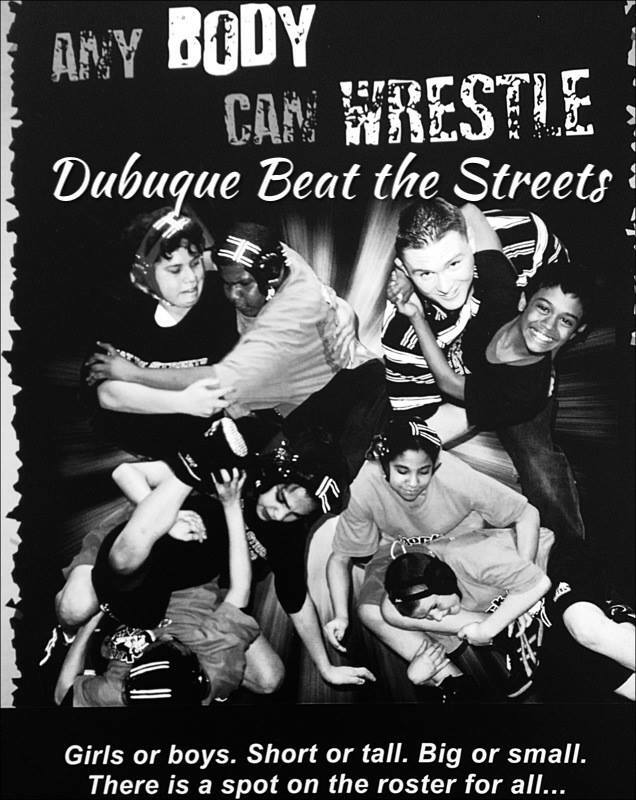 Within this context, Beat the Streets – Dubuque utilizes the sport of wrestling to foster and encourage a desire for excellence, respect for peers, fair play, leadership, and perseverance. With community engagement and investment, Beat the Streets – Dubuque will provide support and direction for youth programs, enhancing young men and women’s lives in school, sports and the community. With a coaching philosophy that is centered on the holistic development of the student-athlete, the Dubuque BTS coaching staff strives to enhance athletes’ physical, intellectual, moral, spiritual, and social characteristics. Believing that the lessons learned through sport can lead individuals to become successful leaders in their communities and work places as well as their future athletic pursuits.